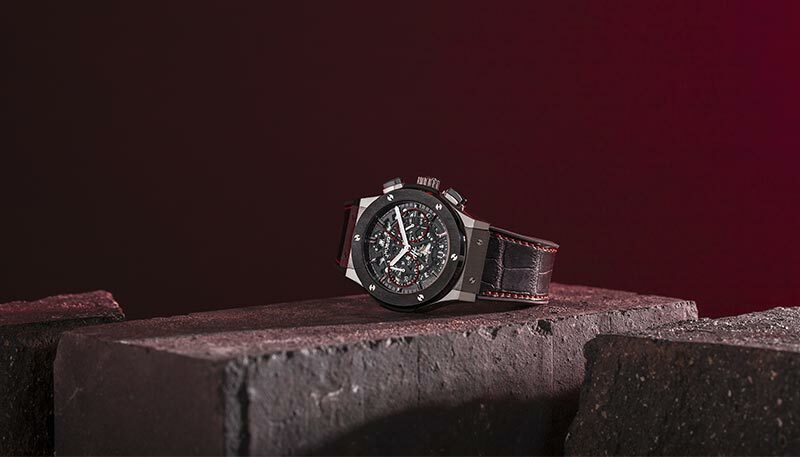 The Swiss Hublot Classic Fusion Aerofusion Chronograph Red marks the fourth such limited-edition timepiece between the Swiss watchmaker and UK retailer, which owns four standalone stores and also operates the watch department of Selfridges. The duo’s past Hublot Classic Fusion Watch co-creations have sold out in weeks, such as last year’s elegant three-hand automatic (£8,200) and a more sporty chronograph (£10,500) that fused ceramic and titanium for the first time. Both were limited to 35 pieces, their 45mm designs featuring The Watch Gallery’s signature blue hue that was found not only on the dials and caseback, but also the seconds hand and stitched on the black alligator-rubber hybrid straps. As the name suggests, the 45mm Aerofusion Chronograph Red explores a new colour palette, its cool red accents a sporting nod that’s having something of a moment right now. Striking, red lacquered rings offset a matching chronograph second hand set on a skeletonised movement, while red stitching on the black rubber and alligator strap continue the crimson motif. 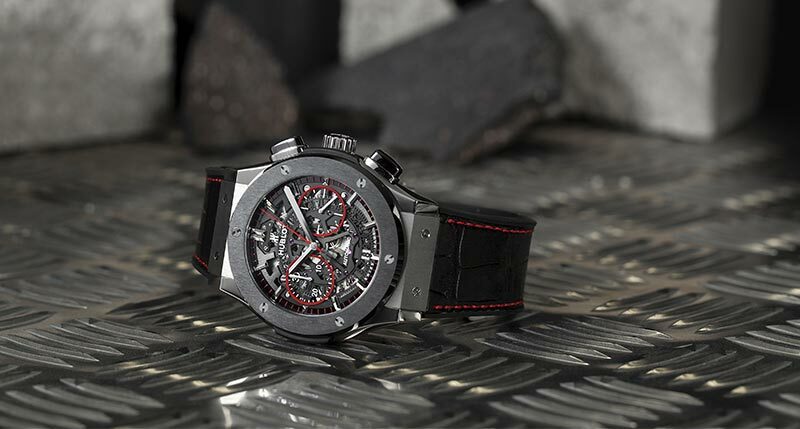 A fusion of titanium case with black ceramic bezel – all satin-finished and polished – add further robustness and echo the house’s innovative use of industrial materials (soon after launching in the 1980s, Hublot made a name for itself merging precious and industrial materials, becoming the first to mix gold and rubber). Indeed polished titanium subtly makes its way throughout the new chronograph – on the screws, crown, and pushers – while a satin-finished titanium caseback is engraved with the edition number. Powering the 13.4mm thick watch is the 207-components, self-winding HUB1155 calibre with a 42-hour power reserve. Water resistant to 50m, the piece also features a date display at 6 o’clock. The new Aerofusion Chronograph Red retails at £13,800 and is available at Selfridges alongside The Watch Gallery’s London stores on Oxford Street, Westfield and the Royal Opera House Arcade, Covent Garden, and on the retailer’s website. The launch of the watch was marked by a glittering event in London last night, presided over by David Coleridge, chairman of The Watch Gallery, and Jean-Claude Biver, chairman of Hublot. The latter promised that anyone buying the watch that evening would be his guest to visit Hublot manufacture’s in Switzerland. ‘You will leave at 5.15 in the morning from Heathrow and return the same day at 10pm,” said Mr Biver with his signature sunny smile. “And get to have lunch with me.” At the time five pieces had already sold, so expect a rather large affair….